This is definitely the season for red suits, trimmed in white fur and big jolly jiggly bellies. Yes, I’m a good buddy with the jolly elf (Think 33 grandchildren! ), but I do worry about his health. We owe the name Santa Claus to the Dutch “Sinterklaas” In our day, Dutch researchers studied over 20,500 men and women aged 20 – 65 years in the Netherlands. (This is an example of a large statistically grounded study.) Obese persons had a four-fold higher risk of fatal cardiovascular disease (CVD) than found in normal-weight persons. The researchers also studied non-fatal CVD, which was found to be two-fold higher in the obese. In addition, the researchers found an equally strong association of Body Mass Index (BMI) and waist circumference (WC). During a 10-year period, women with a waist circumference greater than 34.5 inches were almost three times more likely to suffer non-fatal cardiovascular disease and about two times mere likely to die of heart disease, than those with waists less than 31.5 inches. In men the danger measurement started at 40.1 inches, instead of the low side at 37 inches. The Dutch study is adding to a body of research that shows that abdominal obesity increases the risk of dying from heart disease or stroke. The Dutch study’s participants were an average age of 43 years old; the researchers found that the increased heart disease was linked to those even in their 40s. The Dutch study was about CVD and its relation to WC and BMI, but, in addition, there have been other studies that have shown an increased risk of dementia. A study led by Rachel A. Whitmer, PhD, for example, noted that those with the biggest bellies in middle age were almost three times as likely to develop dementia as compared with those in the lowest one-fifth of waist measurement. Having a proportionally large waist means that you’re more likely to have visceral fat, a type of deep fat around the heart, liver and other internal organs. This deep ‘visceral fat’ seems to be especially dangerous, increasing your risk of insulin resistance, diabetes, some cancers, high blood pressure, high cholesterol levels, and high triglycerides levels. An interesting study at McMaster University in Canada that used imaging to follow the location and amount of fat concluded that decreases in weight resulted to a proportionally higher visceral loss of fat than overall fat loss. P.K. Newby, ScD, MPH, MS, of Tufts’ Friedman School studied, and confirmed in follow-up studies, that one of the main ways to loose visceral fat is to stick with the ‘good carbs’ – whole grains, fruits and vegetables. That is such good news! Something can be done. An interesting fact about the Tufts studies is that they found that those who actually consumed the most carbohydrates had the smallest increase in waist circumference. Newby, who was the lead author of both studies, said that it’s important to look at the quality of carbohydrates the subjects consumed. “Those individuals with the smallest increase in waist circumference were eating carbohydrates rich in fiber, such as fruits, vegetables and whole grains,” Newby explains. “Those eating a lot of refined grains and processed foods had a much larger increase in waist circumference.” The Newby study also found that women who ate the most fiber-rich carbs also saw declines in BMI. This is really such good news. Any of us can (and should) do something about preventing or fixing this belly problem. Santa Claus is of course endowed with magical powers and can slip down tight chimneys, travel at warp speed, and devour enormous quantities of cookies and milk without growing even fatter or having clogged arteries. The rest of us may want to try ‘BMI and WC rehab – or hopefully, preventative care’. In so doing, we can be assured it will be with Santa’s blessing because it is a gift we need. We don’t need to wait until we’re as plump as the jolly elf to begin a weight loss program. Weight management, BMI, WC Rehab – Where to start? 3. Get a tape measure and find out how your waist measures. 4. Weigh yourself or get weighed. 5. Add vegetables, fruit and whole grains to your regular diet. 6. Cut back or stop eating white bread, and processed flour. 7. Stop eating most sugar and other caloric sweeteners. 8. Move away from processed food consumption. Some of these may sound like drastic measures, but a Mediterranean style diet is not drastic – it is delightful and the results make life more enjoyable. With a slim waistline we can sub for the jolly old elf, round and jiggly like a bowl full of jelly, with a well-placed pillow. An alternative to cookies and milk (and even worse choices) for Santa: Fresh fruit, appealing to the eye, palate, waistline and arteries. 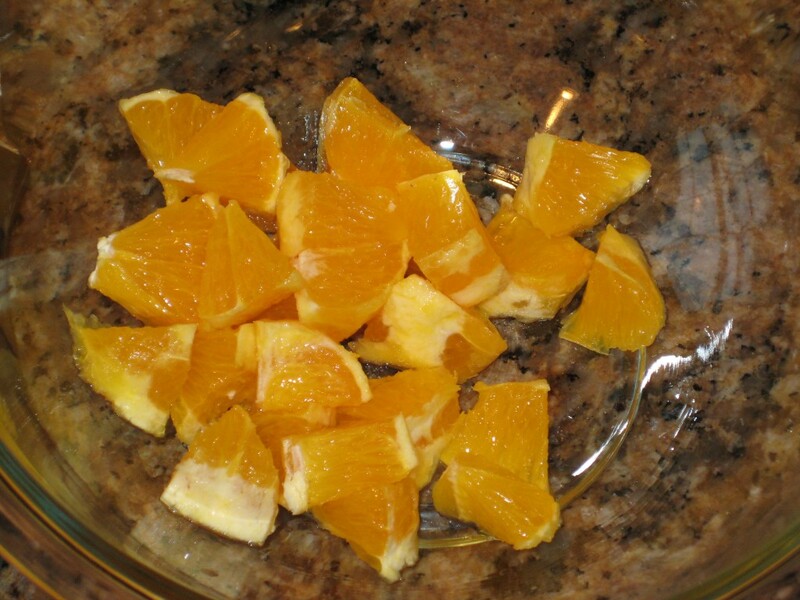 Cut oranges first, or squeeze a bit of lemon or lime. 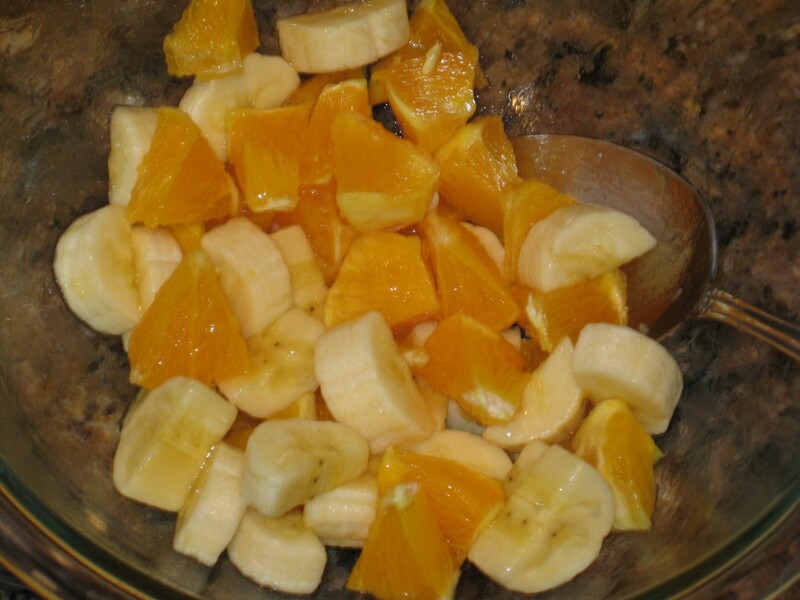 Stir cut bananas into the oranges or citrus juice. 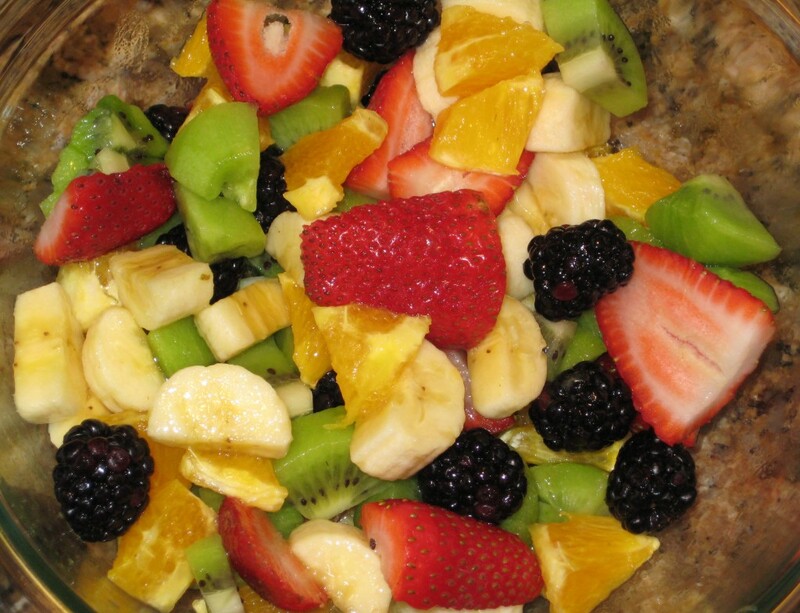 Add other fruit to make a colorful bowl.